Today I have the second half of the gorgeous "Ru Paul" collection holos sent to me from Darling Diva Polish! 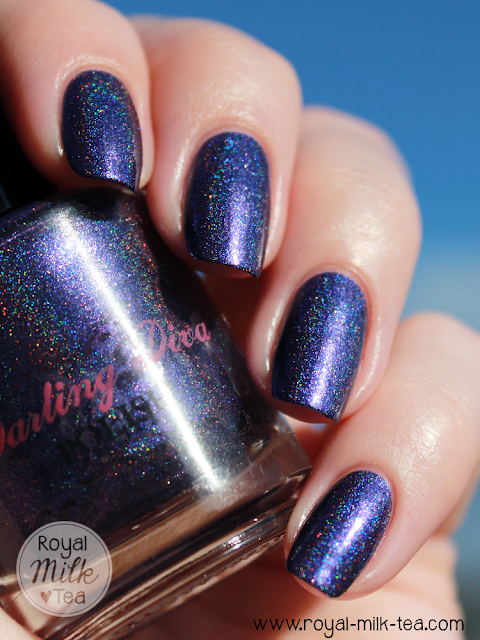 These vivid jewel-toned colors are incredible, and absolutely perfect for Autumn and Winter! 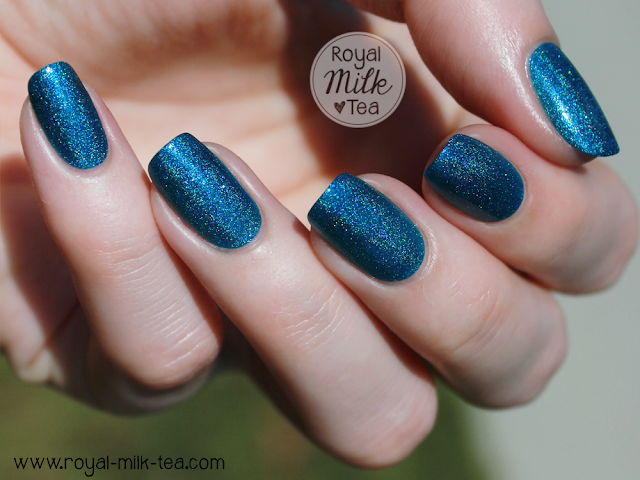 Royale is a bright turquoise/ocean blue linear holographic with a jelly-like finish. 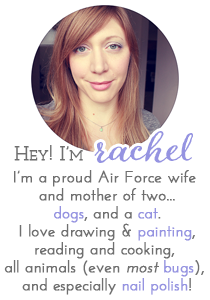 This is such a fantastic blue! 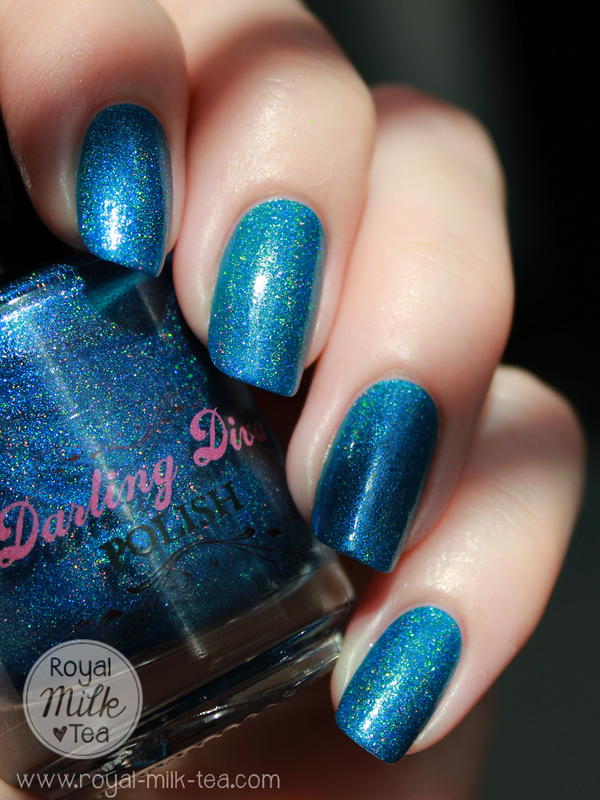 The color is just amazing, I love this shade of turquoise, and the holographic effect is intense and gorgeous in the sunlight. 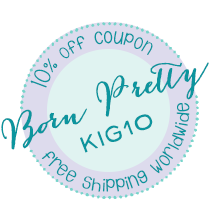 The formula was excellent and very easy to work with. Shown here is three coats on its own. 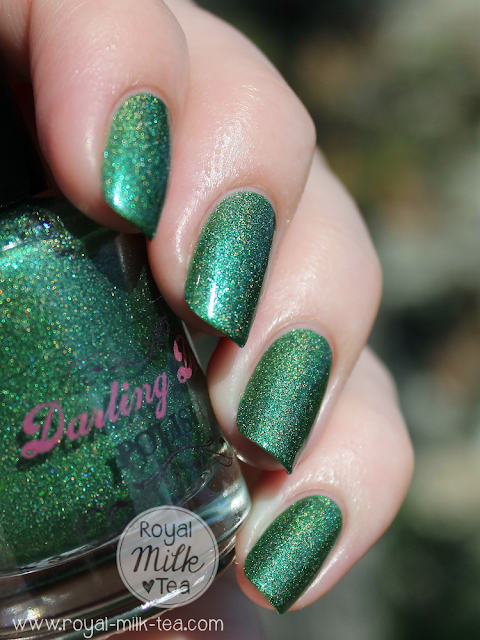 Sashay Away is a beautiful forest green linear holo with a subtle blue shimmer. Another color I absolutely love, this emerald green is so lovely and a rather unique holo shade. The holographic effect isn't super linear, but definitely stunning! 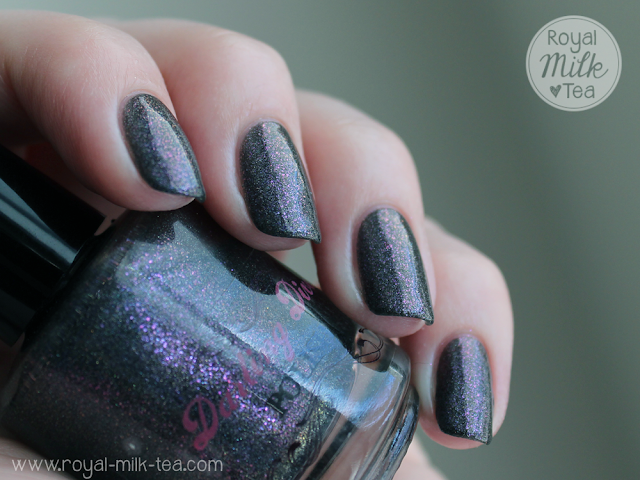 The formula was also wonderful, similar to Royale, and opaque in about 2-3 coats. 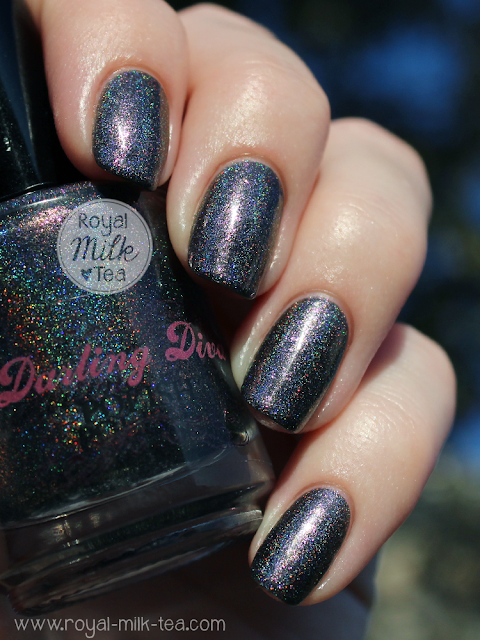 At this angle the holo is really brilliant, just beautiful! Darling Diva Polish And Don't Fxck it Up! And Don't Fxck it Up! 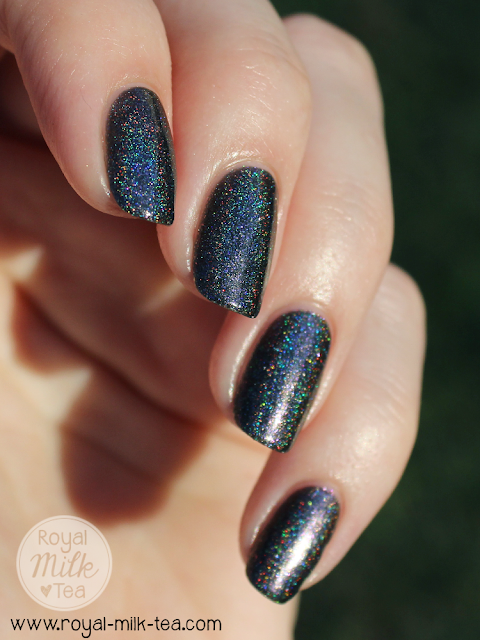 is a lovely deep indigo linear holographic with aqua and violet sparkle. Another favorite color of mine! 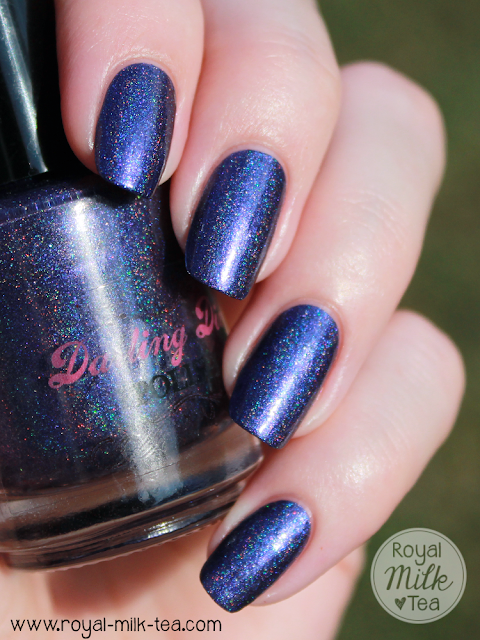 It's the perfect shade of blue-violet, and looks stunning both indoors and out in full sun, where the holo is bright and dazzling. This one also had a perfect formula with very easy application, and took about three coats to become opaque. I love these gorgeous, sparkly rainbows! 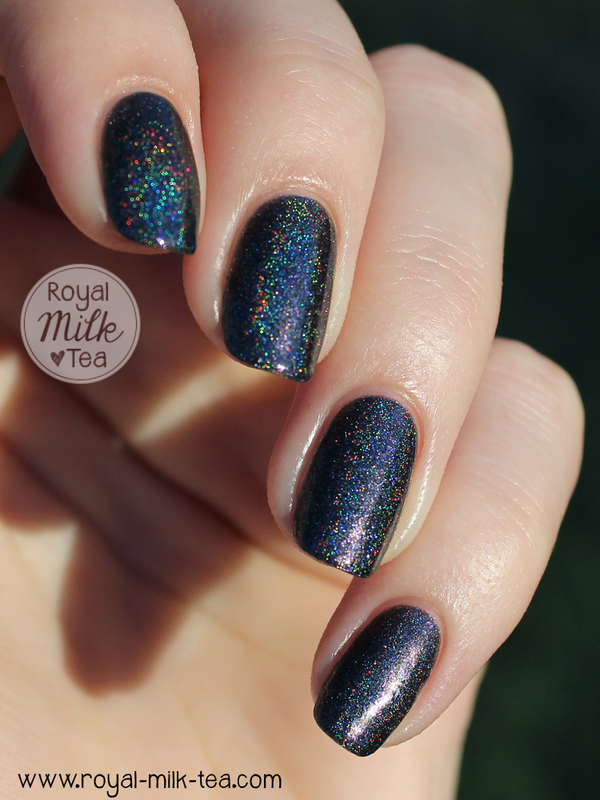 Raven is a spectacular dark charcoal-black linear holographic with beautiful flecks that shift blue, violet, pink and copper/gold. This one was a surprise favorite for me, I love how the black looks with the color-shifting flecks! And outdoors you see both an intense linear holo and a lovely pink shimmer. My favorite colors are the ones I can enjoy in any type of lighting, and Raven is absolutely one of those! Once again, the formula was fantastic and applied perfectly, needing about three coats. Definitely the most wearable black I own; Raven is so chic and dramatic! I can't get over how the charcoal looks even darker outdoors, and with the vibrant prismatic effect it's truly spectacular! I love the colors of this collection, particularly these darker jewel-tones, although there is definitely something for everyone with such a wide range of beautiful and vivid colors, and so befitting of Ru Paul! Very pretty *___* Great swatches! 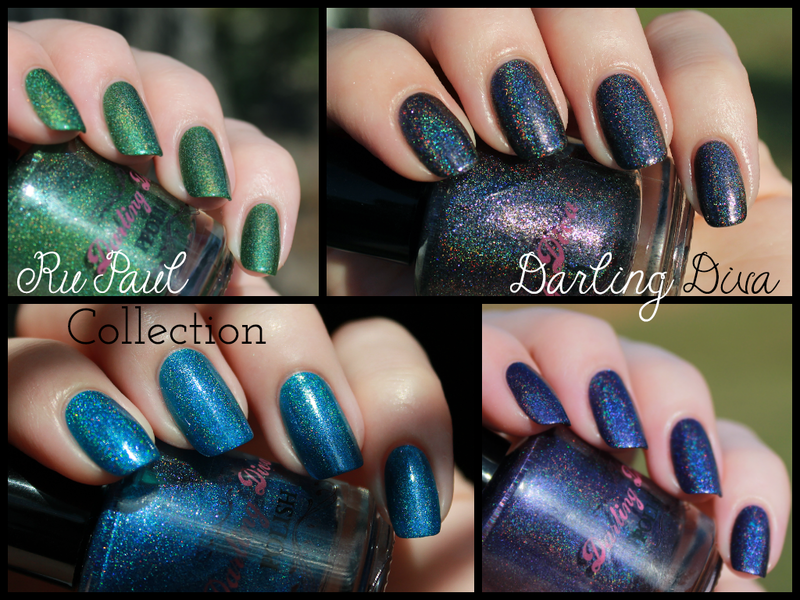 I adore Rupaul, so I might be biased, but these polishes are all gorgeous!